Savor the sun and scenery. If you love to pedal awe-inspiring back-country, Durango, Colorado is the place for you. Feel the road beneath your wheels as you whisk past bubbling rivers and between towering green pines. Take low-gear climbs to stunning elevations where snow-capped peaks beckon your eye. Carve into warm valleys with glorious speed. Ride your bike to see some of the area's first-rate attractions. And between road adventures, do some hiking or whitewater rafting. Based in historic downtown Durango, you will find plenty of like-minded people. Plus there are bike shops to assist your every need—some even provide rentals. Roadies unite. 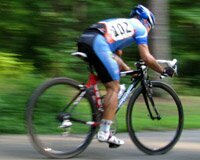 Durango has several biking events during the Iron Horse Bicycle Classic. Join the fun every May when over 2000 cyclists partake in a fun-filled weekend of tours and races designed to challenge riders of all levels. Hit the road! Below you will find several popular road bike routes in and around Durango, CO, listed from most difficult down to easiest. Also see our mountain biking page. Also see Mountain Biking, Bike Shops, and Bicycle Tours and Events. Directions: Begin on Main Avenue (Highway 550) in Durango, riding north. Pass Purgatory and Hermosa Cliffs, onward to Silverton. Consider buying a ticket to ride the Durango-Silverton Narrow Gauge Railroad back to Durango. Directions: Begin on Main Avenue (Highway 550) in Durango. Ride south on Hwy 550/160. Turn left to continue on Hwy 160 (heading east). Ride to Pagosa Springs. When you arrive, you may want to take a soak in the famous Pagosa Springs hot springs. Directions: Begin on Highway 160 heading west. Turn left at Hesperus Store onto Hwy 140 (south). Left on (County Road) CR 141, which is Wildcat Canyon Road. Continue on CR 141 until it ends back at Hwy 160. Turn right on Hwy 160 and return to Durango. Directions: Begin on historical 3rd Avenue, heading north. Continue as the road turns right and becomes Florida Road/CR 240. Pass Edgemont Ranch. Right on (County Road) CR 234. Ride south to Highway 160 and turn right. Head west back to Durango. Directions: Begin on historical 3rd Avenue, heading north. Continue as the road turns right and becomes Florida Road/CR 240. Pass the turn off for Elmore's Loop (CR 234). Veer right to stay on (County Road) CR 240 when the road splits with CR 243. When CR 240 ends, turn right onto CR 501, then turn left shortly after to stay on CR 501. Cross the bridge over the Florida River. Continue on CR 501 south to Hwy 160. Turn right, heading west, to return to Durango. Bakers Bridge - "The Long Valley"
Directions: Begin on Main Avenue (Highway 550) at City Market in Durango. Ride north. Right on 32nd Street and ride until it ends. Left on (County Road) CR 250. Pass Trimble Lane. Ride over Baker's Bridge. Left on Hwy 550. Pass Honeyville. In Hermosa, turn onto (County Road) CR 203 on the right, just past the railroad tracks. CR 203 returns to Durango. Trimble Loop - "The Short Valley"
Directions: Begin at (County Road) CR 250 and ride north. Left on CR 252, which is called Trimble Lane. Pass Dalton Ranch and cross Highway 550. Left on CR 203 and ride south to Durango.